Last weekend a dear friend of ours passed away unexpectedly from a heart attack. He was only 60 years old. This week I’ve learned that my dear Aunt Philo is in poor health. It is that time where life stops giving and start taking. I know there is a season for all things but I don’t like to be sad. It seems to me that if you let sadness into your life, it can become all consuming. Besides, sadness is not going to make things better. Of course, you don’t want to appear heartless, either. Usually when things are sad around the house I try to come up with something uniquely humorous. There used to be a game where you put your head in a picture frame and the first in the audience to laugh lost the game. We have played that game many times in our family. Do you remember the Laverne and Shirley show from back in the 1970’s? There was one show where Shirley was trying to cheer up Laverne and drew an upside down face on her forehead, then bent over backwards on the sofa so it would look like a right side up drawing. You’d have to see it to get the humor. Yes, I did that once. In fact, I was playing around with the kids and did that. We all laughed and the game was over but I forgot to wash my forehead. The doorbell rang. The visitor kept staring at me for sometime before he asked what was on my forehead. I rushed off to wash my face. Then there was the time that I ran into the room with a scarf tied around my head and I was a ninja. That caused a real belly laugh. I’ve done backbends, splits and various other acrobatics to get a laugh when the family is blue. The laughter usually comes when I realize that I cannot get myself out of the position in which I just put my body. Most of the time, I just use laughter. How can anyone stay sad when someone around them is laughing? It is not possible. A friend of mine loves goose down pillows. Well, we weren’t that fancy when I was growing up. Mama had chicken feather pillows. Each morning there would be feathers littered all over my bed because the hard ends would poke through the ticking and I would pull them out in my sleep. Mama would gather them up and save them. Ever so often Mama would make new pillows and we would spend the day pouring the chicken feathers into the new ticking. Feathers would be all over the place. The pillow topic is pertinent because I am washing my bedroom pillows. They don’t get washed as often as they should but I am washing them. They will be all clean and fluffed tonight; although these pillows aren’t even chicken feathers but rather polyester fiber. Last night many of the girls got together at a friend’s home on the beach. We were officially going over to visit our friend who just lost her significant other and was spending a few days on the beach. Unofficially, we were planning a belated birthday party for the hostess. Oh what fun we had! Our birthday girl did not see this one coming. Since I am the official gift hander outer, she received gifts that were placed on the sofa next to her. One after another she unwrapped beautiful and fabulous gifts. She finished opening the gifts on the sofa and was picking up the tissue paper and bows when I told her to hold on, there was another stack of gifts right behind her. The gifts just kept coming. Then we had the birthday cake. OMG! This cake was peanut butter and nothing less than a slice of heaven. I’m sure it did not contain any calories at all. It was so light and fluffy and tasted so good. 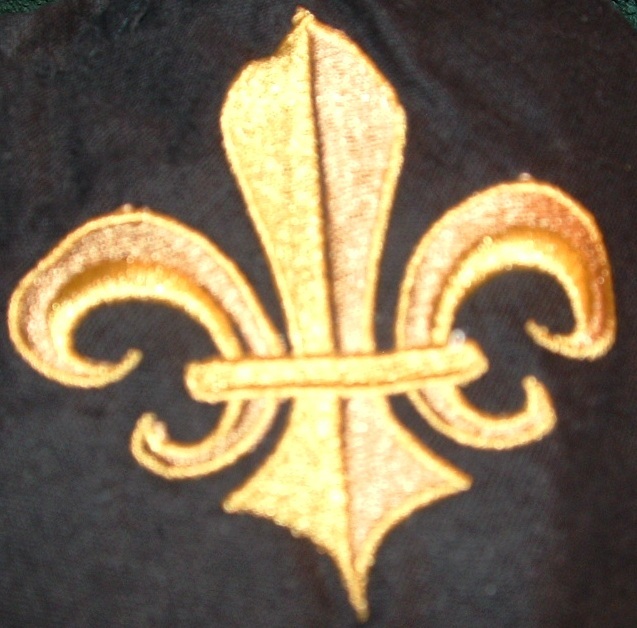 Tomorrow night the Krewe of Wrecks first meeting for 2013 Mardi Gras Season. Oh my goodness, how times flies. 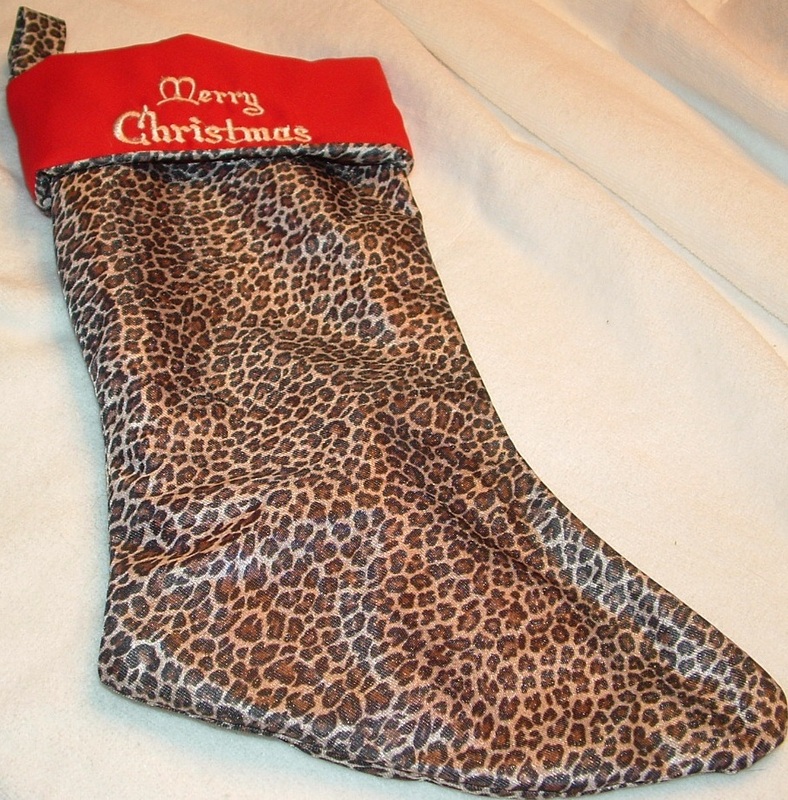 This past week Cajun Stitchery’s Etsy store began stocking its Christmas items. We have less than two months until Christmas. Drop by when you get a chance and browse a bit. In the meantime, I will be listed the items in the attached photos soon. Learn how you can make a fun and unique chalkboard out of an old cupboard door. Search through second hand stores or yard sales to find unwanted doors, or you can even buy an inexpensive, unfinished one at your local home improvement store. This chalkboard is fun to use in a kitchen, an office, or any other room. Instead of using an old cupboard door, why not paint the doors that are on your cupboards!?! I think this would be a fun way to decorate a toy room, office, or craft room. I used a spray paint primer and a brush on chalkboard and latex paint. You can use either brush on paint or spray paint. It really doesn't make a different, it is just a matter of personal preference. Start out by making sure your cupboard door is clean and dust free. If possible, remove the handle. If you cannot remove the handle, cover it completely with masking tape. Cover your work surface with newspaper (I also use wax paper sometimes). Make sure you work in a well ventilated area. Set your cupboard door on the work surface and grab your primer. Use thin layers of the primer to cover it. Wait until one layer is dry to the touch before adding another. When you are done with the primer, let it set to completely dry (follow the directions on your paint can). Once the primer is dry, you are ready to paint the border of the door. I chose a red paint. You can tape off the center area of the cupboard door if you like, but I was just careful when I painted around the edges. Use as many layers as you need to get the shade you want. Like with the primer, when you are done painting the border, let it set to completely dry (follow the directions on your paint can). Now, you are ready for the chalkboard paint. Use a quality paint brush to apply a few layers, allowing each one to dry between coats. Let the chalkboard paint cure for as long as the paint can says. My chalkboard paint can also suggested I condition the chalkboard paint by rubbing the side of the chalk over it and then wiping it off. Don't skip this step, I did with another project and I could not totally erase the lines. Now you can use your new cupboard door chalkboard and enjoy! If you want to hang it, you can screw it directly to the wall and paint the screw heads. You can also use eye hooks screwed to the top or buy picture hanging hardware to attach to the back of the cupboard door. I hope you enjoy making this craft. If you do make it, make sure you send in a photo so it can be posted here. You can also get your own crafts published. You can be one of the first to know when new craft projects are posted by taking a few moments to sign up for the Family Crafts Newsletter and you can also chat about crafts with others in the Family Crafts Forum. Cajun Stitchery's photostream on Flickr. Visit our Flickr site for photos of our embroidery. About six months ago one of my cousins moved to Pensacola. We have been trying to get together ever since she moved here. It is always one thing or another preventing us from meeting face-to-face. Finally, this week we met. Her daughter, my 3rd cousin, is going to be a flower girl in a wedding today and her dress needed to be altered. They came over on Wednesday and we finally got to meet each other. I must say that I was captivated by five year old Claire who was inquisitive and into everything and could charm the socks off of you, as she did me. They returned on Friday to pick up Claire’s now altered dress and she proceeded to charm George. Claire was quite taken with the mermaids at the house and I told her that once a year, on Mardi Gras, I turn into a mermaid. She is no dummy and questioned the possibility: “So, do you have powers?” she inquired. “Yes, I do,” was my answer. “Show me,” she said. Her mother piped in and told her that when you have powers you only use them when necessary and you never abuse your powers. I explained that I only have powers once a year on Mardi Gras. She walked around and played, then came back and asked why I had so many mermaids hanging on my walls. Her mother came back with an absolutely fabulous explanation by saying, “You know how we have pictures of our family at our house? These mermaids are her family.” That seemed to satisfy little Claire who is now waiting for Mardi Gras so she can see my powers. Cajun Stitchery made some new purchases lately. The first one is called Peggy’s Eraser. It is almost identical to an electric razor but used to remove embroidery stitches. We had purchased a regular electric razor but decided that it doesn’t remove stitches as well as one made for that function. Besides, Peggy should have one named Peggy’s Eraser. It just seems right. Peggy’s Eraser has not arrived yet but should in the next week or two. The other recent purchase that we are waiting to receive in the mail is a 6”x12” hoop for Clothilde. Boudreaux has all shapes and sizes of hoops but poor Clothilde has some very large hoops and only two sizes of smaller ones. A few months back we purchased fast frames for Clothilde. 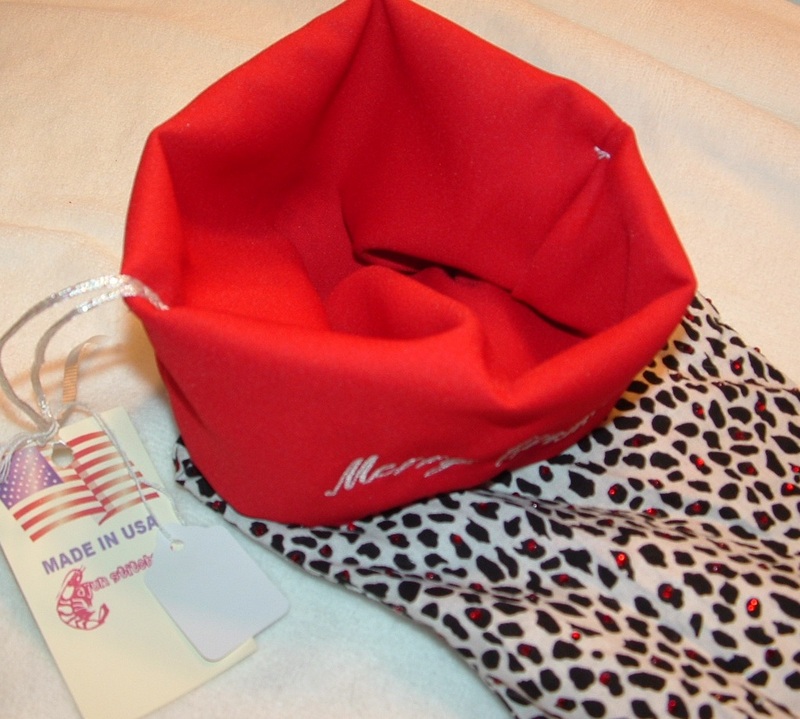 Now we can embroider those market baskets, totes and various object that are hard to hoop. The new hoop is adjustable. It can be 6x12 or 12x6. There are several reasons that this is a good idea. One is that used as a 6x12 hoop, we can hoop pant legs and sleeves. That opens up some really cool embroidery ideas and possibilities. As a 12x6 hoop, it gives more stability to smaller designs and monograms. We had our first fire of the season in our chiminea this week and are planning more as the weather permits. In fact, tonight might be perfect. Another recent purchase was a solar smart phone charger. You know I love alternative energy things. It arrived and not only charges the smart phone but also can be used as a LED light. That is pretty cool to have in my purse when I’m out at night. I haven’t tried charging the phone with it yet. They say that it does take some time to charge via the solar charger but I’m pretty impressed with it. I know they have solar chargers for laptops. Maybe I’ll save up my pennies and buy one of those next. Last night was our krewe’s monthly meeting. Our meetings are held at a different krewe member’s home each month. This month the décor was Halloween and the house was decorated quite cute. It turns out that our hostess is another Pinterest addict. She turned so many of those cute ideas on Pinterest into reality. Speaking of Pinterest, I found an item on Pinterest that said to take a bottle of vinegar, poke holes in the top, and put it in the toilet tank. The vinegar is a non-toxic way of cleaning the toilet bowl and with the extra mass in the tank, you save on water. We tried it. It took a few days for the ring around the bowl to start fading but it does seem to be keeping the bowl clean. 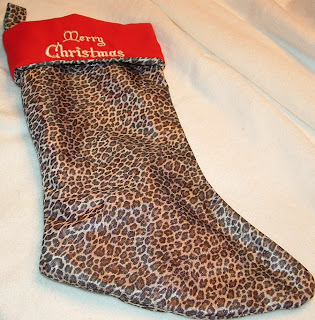 Don’t forget to get your Christmas shopping done early. 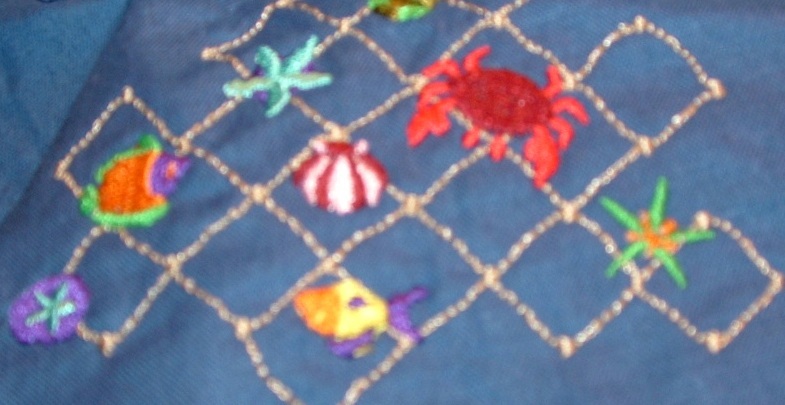 What type of item category would you like to see most at Cajun Stitchery? 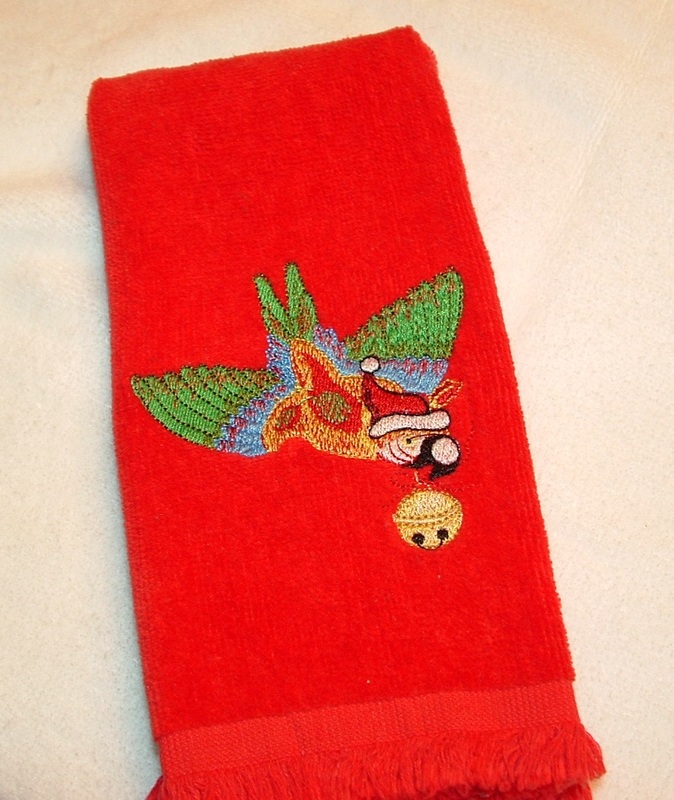 What type of designs would you like to see most at Cajun Stitchery? I apologize to all of our readers. I totally forgot to write Cajun Corner this weekend. This must be a sign of age creeping up on me. A few weeks back I was at the fabric store looking for some tailor chalk. They had a pen with one side having a water soluble ink and the other side of the pen was disappearing ink. I’ve never tried either of these methods of marking fabric but I have heard a lot of positive remarks from friends and on forums. The pen was purchased and while making the recent tablecloth, the water soluble part of the pen was used. The moment came when the ink needed to go away. 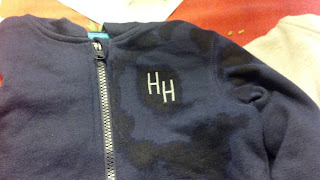 All I did was get a damp cloth and apply water and the ink vanished. It didn’t get smeared like normal ink would; it vanished completely. As the cloth dried some of the ink came back. Not to worry though. It will all disappear completely once washed. The invisible ink on the other end of the pen wasn’t used because the instructions say that it will disappear in about 24-48 hours. That part of the pen wasn’t used since the tablecloth took longer than 48 hours to make and the reference marks were needed. Goodbye tailor’s chalk. Hello water soluble pen. 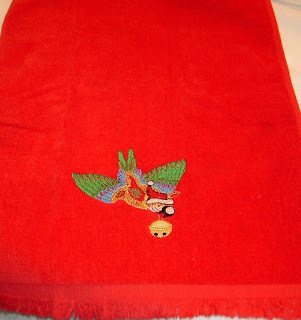 This past weekend towels were embroidered. One of the towels had a beautiful design of mermaids playing with a dolphin. The design had lots of shading and other items that distorted the main design. 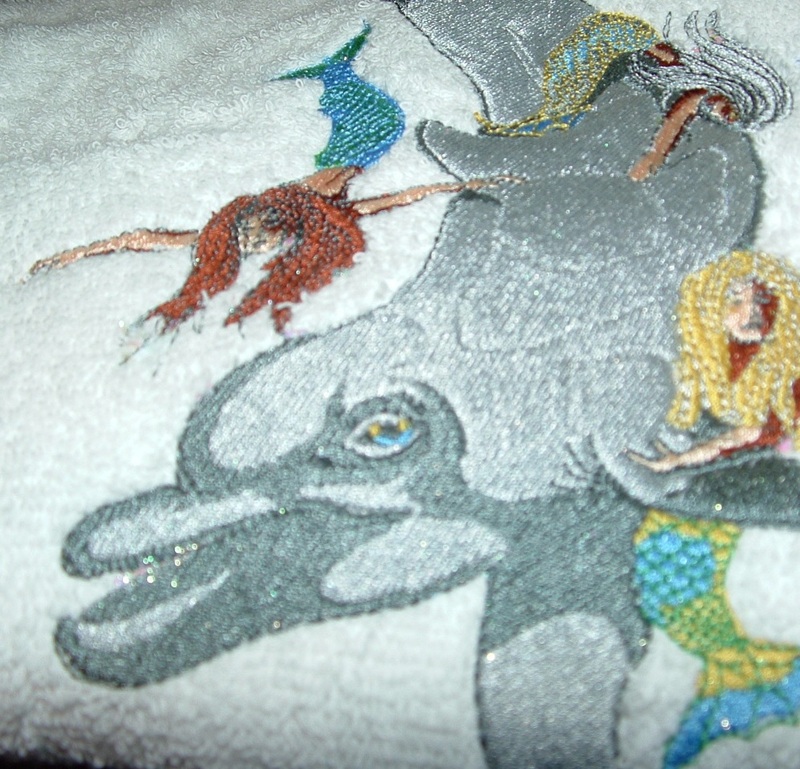 Many of the design parts were removed leaving only the dolphin and mermaids. The dolphin looked a bit goofy with all of the shading but didn’t look right without any shading. Some of the shading was removed and some remained. 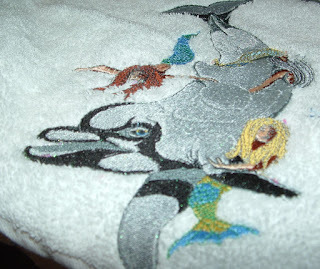 When the design was stitched out a medium gray thread was used for the dolphin and black was used for the shaded areas. 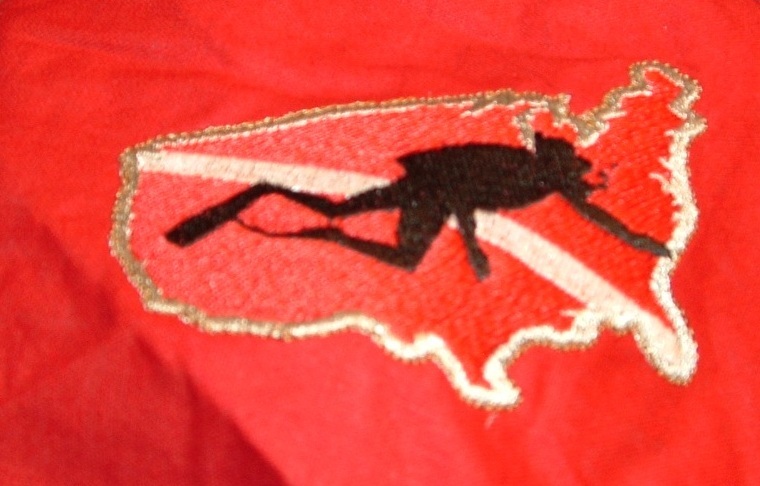 Oh my goodness, once stitched out the black made the dolphin look bad. Then I realized that one of the mermaids only had half a tail. The design was redone using a darker gray instead of the black and the mermaid tail was repaired. It turned out much better. The towel with the original design of the dolphin with the black shading remains as scrap. While on Facebook this past weekend a friend inquired about a design of praying hands. A search through our stock design revealed three designs of praying hands. The photos were posted in reply to the request. The lady was very excited and ordered one of the designs. However, she wanted the design the size of real hands. The design was increased to 7” tall. Her mother’s name was added. I asked what she would like the design embroidered onto and she just didn’t understand. Finally, I told her that the design was pretty heavy and would work well on denim; perhaps the density could be lowered for a lighter fabric. She finally realized what I was asking and said that she would like the design embroidered on a doily to give to her mother for Christmas and thought denim would be “cool.” Hmmmm, denim is an odd fabric for a doily but just because it isn’t the usual, doesn’t mean that it wouldn’t be lovely. A 10” denim circle with a satin stitched edge and the design embroidered inside the circle was done. It wasn’t too bad but does need to be tweaked. Now I’m thinking about adding some lace around the doily to give it a dainty look. While sitting at our kitchen table one evening this week, I heard something on the window and turned to see a large bug crawling on the outside of our window. It was a cicada. I’ve heard them in the trees and I’ve seen their empty casings; but, I don’t think I’ve ever actually seen a live and moving cicada. They are not pretty and probably about 3 or 4 inches long. George looked it up on the internet and they are not dangerous to humans unless you let them stay on your arm or appendage for a long time. They apparently have a long head and tongue hidden under their armor that bores into trees and lays eggs in the wood and eats the inside of the wood. Sometimes they mistake a human arm or leg as a tree branch but only if they have been on the arm or leg for a long time. They do eat your garden. I refused to go outside until George killed the thing. Ewwww, that was creepy. We are still waiting for signs of tomatoes on the beefsteak tomato plants. They have flowers but so far no signs of fruit. The cherry tomatoes have lots of little green tomatoes that we will be harvesting as soon as they show signs of turning red. It is October and Christmas is right around the corner. Are you ready? Ideas for embroidered Christmas gifts: linens, sheets, pillow cases, blankets, bedcovers; towels, bath, beach, hand, wash, fingertip/tea; kitchen towels, pot holds, trivets, coasters, napkins, tablecloth, placemats, apron, plastic bag caddy; and, of course, handkerchiefs, shirts, jackets, and caps. We now offer embroidered doilies, too. by Steven E. Jones, Professor of Physics at Brigham Young University (BYU), with Colter Paulson, Jason Chesley, Jacob Fugal, Derek Hullinger, Jamie Winterton, Jeannette Lawler, and Seth, David, Nathan, and Danelle Jones. As a University Professor of Physics with a background in energy usage, I set out to develop a means of cooking food and sterilizing water using the free energy of the sun. First, I looked at existing methods. The parabolic cooker involves a reflective dish that concentrates sunlight to a point where the food is cooked. This approach is very dangerous since the sun's energy is focused to a point which is very hot, but which cannot be seen. (BYU students and I built one which will set paper on fire in about 3 seconds!) I learned that an altruistic group had offered reflecting parabolas to the people living at the Altiplano in Bolivia. But more than once the parabolas had been stored next to a shed -- and the passing sun set the sheds on fire! The people did not want these dangerous, expensive devices, even though the Altiplano region has been stripped of fuel wood. The box cooker: Basically an insulated box with a glass or plastic lid, often with a reflecting lid to reflect sunlight into the box. Light enters through the top glass (or plastic), to slowly heat up the box. Problems: energy enters only through the top, while heat is escaping through all the other sides, which have a tendency to draw heat away from the food. When the box is opened to put food in or take it out, some of the heat escapes and is lost. Also, effective box cookers tend to be more complicated to build than the funnel cooker. While studying this problem, I thought again and again of the great need for a safe, inexpensive yet effective solar cooker. It finally came to me at Christmastime a few years ago, a sort of hybrid between the parabola and a box cooker. It looks like a large, deep funnel, and incorporates what I believe are the best features of the parabolic cooker and the box cooker. The Solar Funnel Cooker is safe and low cost, easy to make, yet very effective in capturing the sun's energy for cooking and pasteurizing water -> Eureka! Later, I did extensive tests with students (including reflectivity tests) and found that aluminized Mylar was good too, but relatively expensive and rather hard to come by in large sheets. Besides, cardboard is found throughout the world and is inexpensive, and aluminum foil is also easy to come by. And individuals can make their own solar cookers easily, or start a cottage-industry to manufacture them for others. Prototypes of the Solar Funnel Cooker were tested in Bolivia, and outperformed an expensive solar box cooker and a "Solar Cookit" - while costing much less. Brigham Young University submitted a patent application, mainly to insure that no company would prevent wide distribution of the Solar Funnel Cooker. BYU makes no profit from the invention. (I later learned that a few people had had a similar idea, but with methods differing from those developed and shown here.) So now I'm trying to get the word out so that the invention can be used to capture the free energy of the sun - for camping and for emergencies, yes, but also for every day cooking where electricity is not available and even fuel wood is getting scarce. 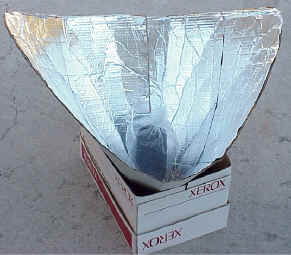 The reflector is shaped like a giant funnel, and lined with aluminum foil. (Easy to follow instructions will be given soon.) This funnel is rather like the parabolic cooker, except that the sunlight is concentrated along a line (not a point) at the bottom of the funnel. You can put your hand up the bottom of the funnel and feel the sun's heat, but it will not burn you. A friend of mine who is also a Physics Professor did not believe I could actually boil water with the thing. So I showed him that with this new "solar funnel cooker," I was able to boil water in Utah in the middle of winter! I laid the funnel on its side since it was winter and pointed a large funnel towards the sun to the south. I also had to suspend the black cooking vessel -- rather than placing it on a wooden block. This allows the weaker sun rays to strike the entire surface of the vessel. Of course, the Solar Funnel works much better outside of winter days (when the UV index is 7 or greater). Most other solar cookers will not cook in the winter in northern areas (or south of about 35 degrees, either). A glue such as white glue (like Elmer's glue), and water to mix with it 50-50. Also, a brush to apply the glue to the cardboard (or a cloth or paper towel will do). Or, some may wish to use a cheap "spray adhesive" available in spray cans. You can also use wheat paste. Three wire brads-- or small nuts and bolts, or string to hold the funnel together. For a cooking vessel, I recommend a canning jar ("Ball" wide-mouth quart jars work fine for me; the rubber ring on the lid is less likely to melt than for other jars I've found. A two-quart canning jar is available and works fine for larger quantities of food, although the cooking is somewhat slower.). The cooking jar (or vessel) should be spray-painted black on the outside. I find that a cheap flat-black spray paint works just fine. Scrape off a vertical stripe so that you have a clear glass "window" to look into the vessel, to check the food or water for boiling. A block of wood is used as an insulator under the jar. I use a piece of 2"X4" board which is cut into a square nominally 4" x 4" by about 2" thick. (10cm square x 5cm thick.) One square piece of wood makes a great insulator. · An idea attributed to Roger Bernard and applied now to the BYU Funnel Cooker: place a pot (having a blackened bottom and sides) in a glass bowl, and cover with a lid. Try for a tight fit around the bottom to keep hot air trapped inside. The metal pot or bowl should be supported around the rim only, with an air space all around the bottom (where the sunlight strikes it). Put a blackened lid on top of the pot. 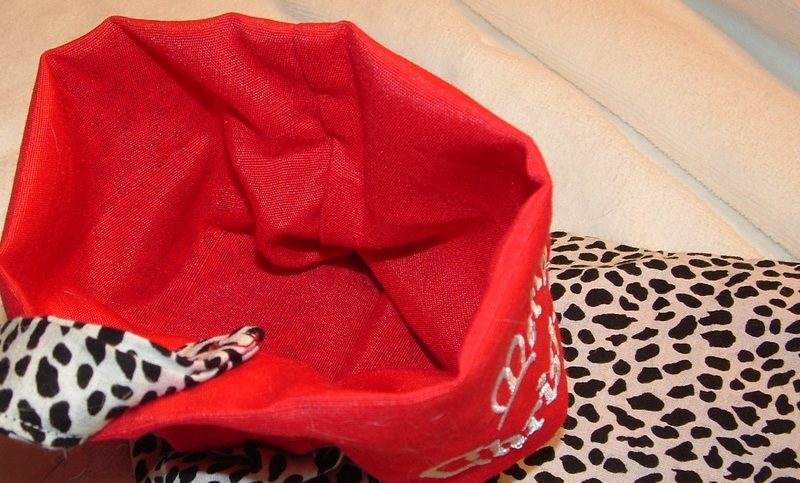 Then simply place this pot-in-bowl down in the bottom of the funnel - no plastic bag is needed! This clever method also allows the cook to simply remove the lid to check the food and to stir. I like this idea - it makes the solar cooker a lot like cooking over a fire. See Photographs for further details. To form the funnel, you will bring side A towards side B, as shown in the figure. The aluminum foil must go on the INSIDE of the funnel. Do this slowly, helping the cardboard to the shape of a funnel by using one hand to form creases that radiate out from the half-circle. Work your way around the funnel, bending it in stages to form the funnel shape, until the two sides overlap and the half-circle forms a complete circle. The aluminum foil will go on the INSIDE of funnel. Open the funnel and lay it flat, "inside up", in preparation for the next step. Place a wooden block in the INSIDE bottom of the cooking bag. I use a piece of 2X4 board which is cut into a square nominally 4"X4" by about 2" thick. Then place the cooking vessel containing the food or water on top of the wooden block, inside the bag. Remember: Sunlight can hurt the eyes: Please wear sunglasses when using a Solar Cooker! The Funnel Cooker is designed so that the hot region is deep down inside the funnel, out of harm's way. It helps to put the Solar Funnel Cooker in front of a south-facing wall or window (in the Northern Hemisphere) to reflect additional sunlight into the funnel. A reflective wall is most important in locations farther from the equator and in winter. In the Southern Hemisphere, put the Solar Funnel Cooker in front of a North-facing wall or window to reflect additional sunlight into your cooker. Remember that the cooking vessel will be very hot: Use cooking pads or gloves when handling! If you are heating water in a canning jar, you may notice that the water is boiling when the lid is first removed - it gets very hot! I have personally used the Solar Funnel Cooker to cook lunches over many weeks. My favorite foods to cook are potatoes (cut into logs or slices) and carrot slices. Vegetables cook slowly in their own juices and taste delicious. I also make rice, melted cheese sandwiches, and even bread in the Solar Funnel Cooker. I usually put the food out around 11:30 and let it cook until 12:45 or 1 pm, just to be sure that it has time to cook. I've never had any food burn in this cooker. I have also cooked food in the mountains, at an altitude of around 8,300 feet. If anything, the food cooked faster there - the sunlight filters through less atmosphere at high altitudes. I find that people are surprised that the sun alone can actually cook food. And they are further pleasantly surprised at the rich flavors in the foods which cook slowly in the sun. This inexpensive device does it! Students at Brigham Young University have performed numerous tests on the Solar Funnel Cooker along with other cookers. We have consistently found much faster cooking using the Solar Funnel Cooker. The efficiency/cost ratio is higher than any other solar cooking device we have found to date. Mr. Hullinger also performed studies of transmissivity, reflectivity and absorptivity of alternate materials which could be used in the Solar Funnel Cooker. While there are better materials (such as solar-selective absorbers), our goal has been to keep the cost of the Solar Cooker as low as possible, while maintaining safety as a first priority. I also donated two dozen solar funnel cookers for people in Guatemala. These were taken there by a group of doctors going there for humanitarian service. The people there also liked the idea of cooking with the sun's free energy! For an aluminized-Mylar Solar Funnel Cooker kit, please contact CRM (licensed manufacturer) at +1 (801) 292-9210. Contaminated drinking water or milk kills thousands of people each day, especially children. WHO reports that 80% of illnesses in the world are spread through contaminated water. Studies show that heating water to about 65º - 70º C (150º F) is sufficient to kill coliform bacteria, rotaviruses, enteroviruses and even Giardia. This is called pasteurization. Pasteurization depends on how hot and how long water is heated. But how do you know if the water got hot enough? You could use a thermometer, but this would add to the cost, of course. When steam leaves the canning jar (with lid on tight) and forms "dew" on the inside of the cooking bag, then the water is probably pasteurized to drink. (The goal is to heat to 160º Fahrenheit for at least six minutes.) With a stripe of black paint scraped off the jar, one can look through the bag and into the jar and see when the water is boiling - then it is safe for sure. The cooking vessel (jar) is going to get hot, else the food inside won't cook. Let the jar cool a bit before opening. Handle only with gloves or tongs. What do you cook in a crock pot or moderate-temperature oven? The same foods will cook about the same in the Solar Funnel Cooker -- without burning. The charts below give approximate summer cooking times. Pasteurize water for safe drinking, preventing many diseases. Americans should be prepared for emergencies, incident to power failures. A Mormon pioneer noted in her journal: "We were now following in their trail traveling up the Platte River. Timber was sometimes very scarce and hard to get. We managed to do our cooking with what little we could gather up..." (Eliza R. Snow) Now there's someone who needed a light-weight Solar Cooker! It is interesting to note that most developing countries are located near the equator where the sun is nearly directly overhead all the time. Solar Cookers will then serve year-round, as long as the sun is shining, for these fortunate people. They may be the first to apply fusion energy (of the sun) on a large scale! And they may accomplish this without the expensive infrastructure of electrical power grids that we take for granted in America. A graduate student at Brigham Young University did a calculus calculation over two years ago to assess the best shape or opening angle for the Solar Funnel. Jeannette Lawler assumed that the best operation would occur when the sun’s rays bounced no more than once before hitting the cooking jar, while keeping the opening angle as large as possible to admit more sunlight. (Some sunlight is lost each time the light reflects from the shiny surface. If the sunlight misses on the first bounce, it can bounce again and again until being absorbed by the black bottle.) She set up an approximate equation for this situation, took the calculus-derivative with respect to the opening angle and set the derivative equal to zero. Optimizing in this way, she found that the optimum opening angle is about 45 degrees, when the funnel is pointed directly towards the sun. For questions regarding the complete Solar Funnel Cooker kit using aluminized Mylar and a jar for the cooking vessel, please contact CRM at +1 (801) 292-9210. Recent updates to this project can be found at http://physics1.byu.edu/jones/rel491/solarbowl.htm.